The Ettrick 2-Light Oil-Rubbed Bronze Vanity Light from Hampton Bay features a contemporary design that is well suited for transitionally styled decor. Evoking a warm and rich feel with a hand-painted, oil-rubbed bronze finish, the fixture presents hand-painted linen glass shades for a clean contrast. Ideal for your hallway, bath or powder room, this sconce is easy to install and coordinates beautifully with other pieces from the Ettrick collection for a matching ensemble. This 2 light vanity highlights white frosted glass shades to match contemporary dicor. The vanity bar can be mounted vertical or horizontal to suit your personal style. The fixture is finished in polished chrome which matches most home styles. Add up to date styling to any room in your house. This frosted glass wall sconce lends a modern touch to any area and is ideal for any decor. The unique glass design creates a brilliant effect when lit. 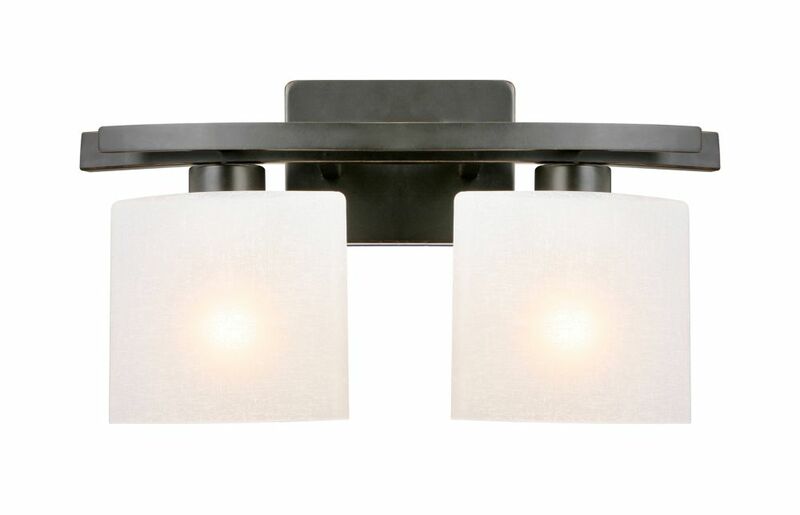 Ettrick 2-Light Oil-Rubbed Bronze Vanity Light with Linen Glass Shades The Ettrick 2-Light Oil-Rubbed Bronze Vanity Light from Hampton Bay features a contemporary design that is well suited for transitionally styled decor. Evoking a warm and rich feel with a hand-painted, oil-rubbed bronze finish, the fixture presents hand-painted linen glass shades for a clean contrast. Ideal for your hallway, bath or powder room, this sconce is easy to install and coordinates beautifully with other pieces from the Ettrick collection for a matching ensemble. Ettrick 2-Light Oil-Rubbed Bronze Vanity Light with Linen Glass Shades is rated 4.6 out of 5 by 23. Rated 5 out of 5 by HomeDepotCustomer from The lights were exactly what I was looking for. ... The lights were exactly what I was looking for. They matched other accessories very well. I think they were a little over priced, but I am happy with the purchase. Rated 5 out of 5 by HomeDepotCustomer from Remodeled the bathroom. This fixture was perfect. Easy to install.... Remodeled the bathroom. This fixture was perfect. Easy to install. Now I just need to keep track of the gadget that helps screw in the stop for the shade. Rated 5 out of 5 by mwareingmaitland from Finish looked great and simple to install. ... Finish looked great and simple to install. Rated 3 out of 5 by Sandie from I like the vanity lights. However, consumers should be aware... I like the vanity lights. However, consumers should be aware that there are extreme variations in the color of the glass shades and at least two distinctly different patterns. It took going to three different Home Depots to find two sets of shades that matched well enough to hang near each other. Rated 4 out of 5 by Tom from Very nice product. Easy assembly and installation.... Very nice product. Easy assembly and installation.